The announcement this morning to participants at the Council meeting of the Synod Secretariat. "Pope Benedict handed it to me, it is a powerful document, although I will say that there I received this great work: he began it and I carried it forward." In his speech, Francis says that the proclamation of the Gospel must not be afraid of "new paths" and speaks of "the further development" of the Synod of Bishops. Vatican City (AsiaNews) - "An encyclical will soon be published which, so to say, is the work of four hands" Pope Francis, speaking off the cuff, has announced the imminent publication of the document that Benedict XVI was preparing for the Year of Faith. "Pope Benedict handed it to me, is a powerful document, although I will say that I received this great work: he began it and I carried it forward." The announcement was made this morning to the participants at the 13th Ordinary Council of the General Secretariat of the Synod of Bishops, received in the Vatican Consistory Hall. The announcement was made to "justify" the lack of an answer to a question on the post-synodal exhortation. "There is a problem," the Pope explained. If published "at the moment" the exhortation risks being "hidden" by the encyclical. "Then I thought that the Year of Faith will end without a nice document that can help us. 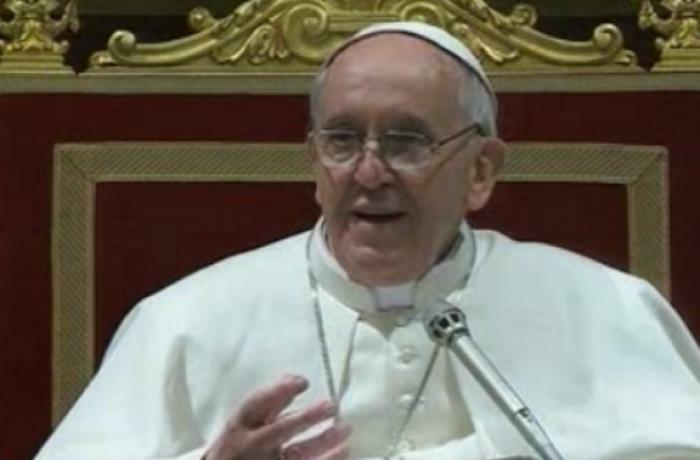 I thought about doing an exhortation on evangelization in general and including things from the synod." A text, in short, that includes the ideas "of the Synod" but comprises, "broader" themes on "evangelization in general." "I liked the idea and I will continue along that path. I have already written something, in August the house will be quieter and I can work on something and move a little 'ahead." Prior to the announcement, Francis had said that the new evangelization "must be led by the Holy Spirit, even if it brings us down new roads" and the Synod of bishops is an instrument in reaching this goal. The Pope added that there will be further developments to the Synod "to encourage even more dialogue and collaboration between the Bishops and between them and the Bishop of Rome. " Proclamation of the Gospel, even in countries of ancient Christian and collegiality among the bishops and the Pope was the focus of the Pope's address to the Assembly: The new evangelization for the transmission of the faith. "There - he said - is a close connection between these two elements: the transmission of the Christian faith is the purpose of the new evangelization and the entire evangelizing work of the Church, which exists precisely for this [purpose]. The term "new evangelization", then, highlights the increasingly clear awareness that even in countries with an ancient Christian tradition the need has arisen for a renewed proclamation of the Gospel, to lead [people] back to an encounter with Christ that transforms life and really is neither superficial nor by rote. This has consequences for pastoral activity. As the Servant of God Paul VI observed, "The conditions of society force us to revise methods, to seek by every means to study how to bring the Christian message to modern man, in which alone he can find the answer to his questions and strength for his commitment of human solidarity. (Address to the College of Cardinals, June 22, 1973)". The same Pontiff, in Evangelii nuntiandi, a rich text that has lost none of its relevance, reminded us, "[The commitment to proclaim the Gospel] is without any doubt a service rendered to the Christian community, but also to humanity. (n. 1)" I would encourage the whole ecclesial community to be evangelizing, not to be afraid of "going out" to announce themselves, trusting especially in the merciful presence of God to guide us. Techniques are certainly important, but even the most advanced [technique] could not replace the discreet but effective action of Him, who is the principal agent of evangelization: the Holy Spirit (cf. ibid., 75). We need to let ourselves be led by Him, even if He takes us on new roads; we need to let ourselves be transformed by Him, in order that our [gospel] proclamation be made through words that are always accompanied by simplicity of life, by a spirit of prayer, of charity towards all, especially the young and the poor, by humility and detachment from self, by holiness of life (cf. ibid., 76). Only in this way will it be really fruitful!". As for the Synod of Bishops, which Francis defined as "one of the fruits of the Second Vatican Council", in its almost fifty years, "we have been able to experience the benefits of this institution, which, is placed permanently at the service of communion and the mission of the Church, as an expression of collegiality. I can also attest to this, on the basis of my personal experience, having participated in several Synod assemblies. Open to the grace of the Holy Spirit, soul of the Church, we are confident that the Synod of Bishops know further developments to facilitate even further the dialogue and collaboration between the Bishops and between them and the Bishop of Rome". Francis finally thanked them for the cooperation of the various ecclesial realities with the Synod Secretariat, the Pope indicated possible themes of the next general meeting. "I'm sure - he concluded - that with discernment accompanied by prayer, this work will bring abundant fruits to the whole Church, which, faithful to the Lord, want to proclaim with renewed courage Jesus Christ to the men and women of our time. He is "the way, the truth and the life, (Jn 14, 6)" for one and all". 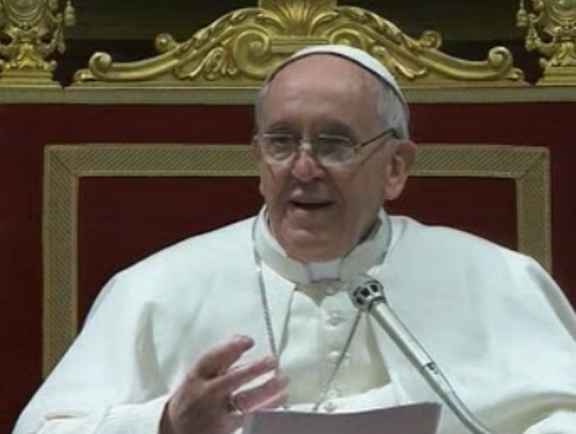 Pope: faith holds answer to those who want to impose the "reign of money"